So it wasn't that long ago that health insurers could deny someone coverage if they had a pre-existing condition. These are some of the insurance companies' most expensive consumers. To learn more about how this has changed and how it affects our taxes, we turn now to Julie Rovner of Kaiser Health News. Julie, welcome to the program. JULIE ROVNER, BYLINE: Thank you. WERTHEIMER: So the Affordable Care Act protects people with pre-existing conditions. They cannot be denied coverage, but how does it do that? ROVNER: Well, the principal way that it does it is by trying to get more people into the insurance pool so the insurers won't just have the sick people buying coverage. And the main way it goes about getting more people into the insurance pool is this individual mandate that says, you either have to have insurance, or you have to pay a tax fine. And that's why insurance is now on everybody's taxes. WERTHEIMER: So here's the big question. With everything that's been going on with the health care law over the past few months, are the law's tax requirements still in force? ROVNER: Yes, they are. Nothing has actually been repealed or formally changed in the law yet, so everybody has to do something. It's basically three groups of people. For most people, they'll just have to check a box that said, yes, I had insurance. People who didn't have insurance or who didn't have it for longer than three months during the year might have to pay a penalty. And people who bought their insurance through the health exchange under the law - and if they got tax credits, they actually have to fill out yet another form to reconcile how much they got in tax credits with how much they should have gotten. WERTHEIMER: Julie, what does it mean that President Trump then ordered federal agencies to reduce the burdens of the health law. ROVNER: Well, he did indeed do that through an executive order, but he can't change the law itself. So the only real change that's been made so far is that the IRS has said that they wouldn't send your return back if you didn't check that box saying whether or not you had health insurance. It's not really a change because the IRS hasn't been kicking back returns for the last two years, but this year, they were going to, and they decided not to because of the executive order. WERTHEIMER: So let's take these one at a time. If you had health insurance last year, what do you need to do? ROVNER: You just need to check that box on your 1040 form that says you had insurance, and you're done. WERTHEIMER: And if you did not have insurance? ROVNER: Well, then you might have to pay a fine. Now, the fines have been phasing in gradually. Twenty-sixteen is the first year for what's supposed to be the permanent amounts. It's the greater of $695 or 2 and a half percent of your income if you didn't have insurance for the entire year. It's done by the month. 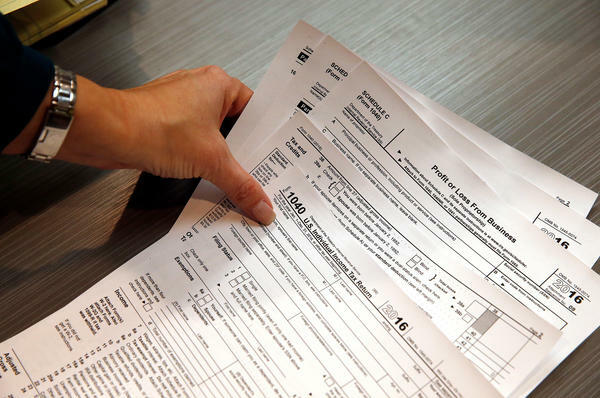 The IRS said 6 and a half million people paid fines last year that averaged $470, although that was far less than the 8 million who paid fines the first year the requirement was in effect. WERTHEIMER: Now, you said if you didn't have insurance, you might have to pay a fine. Who does not have to pay a fine? ROVNER: Well, there are lots of ways to avoid the fine. Last year, almost 13 million people claimed an exemption from having to pay. The most popular reason was that they didn't earn enough to have to file an income tax return in the first place. Also, citizens living abroad didn't have to pay a penalty. Or if you filed for bankruptcy or if the cheapest health plan available to you would cost more than 8 percent of your income - and there are lot more exemptions. WERTHEIMER: So what if you bought insurance on a health exchange and had help from the government to do it. ROVNER: Well, these are the tax credits that we've been hearing so much about. And if you got one of them, then you have to fill out a very complicated separate form to see if the tax credits you got from the government were too much or too little or just the right amount. Last year, for tax year 2015, more people ended up having to pay back tax credits than got additional money, although in most cases, even those who had to pay back tax credits, meaning they got too much, still got a refund overall on their taxes. WERTHEIMER: So what can the government do to you if you don't pay? ROVNER: Not very much. This was a big point of debate when Congress was writing the health law. They didn't want the idea of people getting thrown in jail for not having health insurance. So, basically, the IRS can deduct what you owe in health insurance tax credits from any tax refund you have coming overall, but they can't send people after you for money the way they can if you don't pay your regular taxes. WERTHEIMER: Julie Rovner of Kaiser Health News, thank you very much. WERTHEIMER: This story is part of a reporting partnership between NPR, WHYY's health show The Pulse and Kaiser Health News. Transcript provided by NPR, Copyright NPR.